Tragedy-struck Malaysia Airlines faces a business restructure that could have the carrier renamed, with Malaysia state-run investment firm Khazanah Nasional announcing it wants to buy the shares and delist the firm from the stock market. The news comes as the airline continues to reel from the impact of two major disasters – the disappearance of flight MH370 and the shooting down and crash of flight MH17 in Ukraine, both of which killed hundreds of people. The investment firm said that the "complete overhaul" would cover "all relevant aspects of, inter alia, the airline’s operations, business model, finances, human capital and regulatory environment". The company said that more details would be revealed at the end of the month. Malaysia Airlines has been struggling to make money for years. In May, it reported its fifth consecutive quarter of net loss, down 59% to 443m ringgit (£82m) for three months ending March 2014. Trading in shares in Malaysia Airlines has now been suspended, marking the first stage of the Malaysian government’s overhaul plan. Khazanah Nasional will offer 27 Malaysian sen for each share in the 31% stake of the company it does not own. Khazanah Nasional said in a statement: "We reiterate that the proposed restructuring will critically require all parties to work closely together to undertake what will be a complete overhaul of the national carrier on all relevant aspects. "Nothing less will be required in order to revive our national airline to be profitable as a commercial entity and to serve its function as a critical national development entity." Responding to the proposed delisting, Malaysia Airlines issued the following statement: "We have received notice of Khazanah’s intentions to take full ownership and delist Malaysia Airlines. "Our board of directors will be deliberating this proposal and an official response from the company will be issued later. During this period, our business operations remain unchanged." 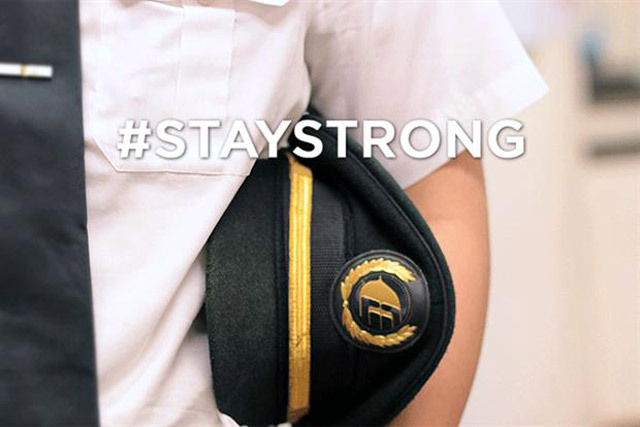 In July, the airline launched its first major brand campaign in recent years in South East Asia, UK, Europe and China. It featured the hashtag #StayStrong.